An exceptional presentation of love and full of meaning, this custom box gift contains a stunning real rose dipped in 24 Karat gold. 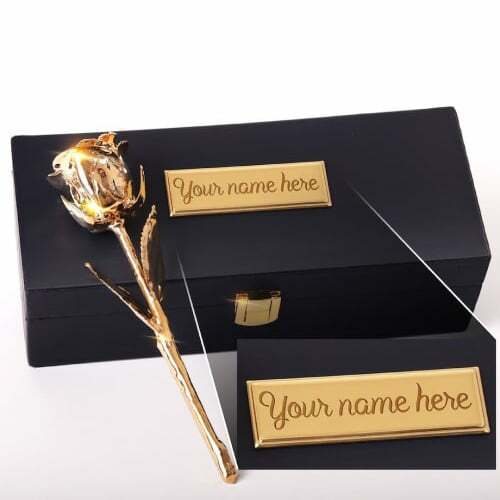 Who would be able to resist this custom engraved box – 24 karat gold dipped natural rose 7″ resting inside? The leather luxury display case is adorned with a gold label where you can add the name of your loved one or a meaningful phrase so that it is intensely personal for the recipient. Inside the case is a real red rose that measures about 7″ that has been dipped in 24 karat gold and is perfectly preserved. This stunning rose will never die or fade. You know you have the “real thing” with the accompanying Certificate of Authenticity! This unique gift for your special someone is more durable than you may think and is sure to become a treasured heirloom for years to come. Delivery times vary according to where it is being shipped so shop now to be sure it arrives in time for Christmas!